At the end of the First World War, the landscape of the Western Front in Flanders had been transformed into a wasteland. After the war, the population returned, faced with the enormous challenge of rebuilding the region and making it inhabitable again. All traces of the war were wiped out, leaving only what was left in the ground – what is now the archaeological soil archive. Throughout the Westhoek, 30 centimetres beneath the ground and invisible to the naked eye, the archaeological remains of the war lie dormant. This book, the first of its kind, is a compendium of the findings of ten years of First World War archaeology in Belgium. 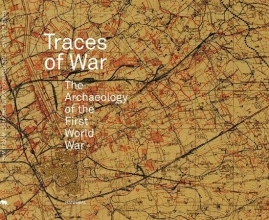 Clearly written, it looks at many spectacular finds resulting from excavations at more than 150 sites in the front-line region, and also delves into the unexpected role of the landscape as the last witness of the war. These material remains from military camps, hospitals and trenches illustrate day-to-day life at the front, while also looking at the personal fates of several of the fallen soldiers – and many horses. The text is supported by a wealth of visual data, including photographs of excavated artefacts, maps, aerial photographs and other archive material. This book is published to coincide with the exhibition of the same name in the In Flanders Fields Museum, Ypres, Belgium (until 30 September 2018).